Looking for secure, reliable, efficient Gatwick meet and greet parking or park and ride service, Your welcome to Simply Park and Fly, here you can save up to 70% with approved Gatwick car park operators. Compare prices from various Gatwick parking service providers and get the best parking options for meet and greet, on-site parking or park and ride for short stay or long stay. You'll find the best Gatwick parking options with approved parking opperators. Our Gatwick parking options are listed below, click on a car parks name to find out more information about a specific parking service. To avail the best from the Gatwick parking comparison, make sure to book in advance. Your comfort is our priority. Booking your Gatwick parking at earnest to the terminals & saves you any inconvenience that you may face during parking and to make your travelling experience ever better. We are efficient and value your money. Gatwick parking services aim to you secure and the most convenient services. All of staff is friendly and aims to make your travel experience perfect. Compare all of our Gatwick Parking deals in the comparison table above and find the best Gatwick car park to suit you, you'll find our cheapest Gatwick parking deals starting with our trusted Gatwick parking services followed by the ultra-convenient meet and greet or park and ride packages. You’ll find the best deals and cheap Gatwick parking spaces at Gatwick Airport if you research just a little. You have a choice of long stay parking, short stay parking and meet and greet parking, at both Gatwick’s North and South terminals. Every service provided is unique in its own way and also easy on your budget. Off airport parking service, like Long stay parking service is one of the cheapest Gatwick parking options that you can avail. 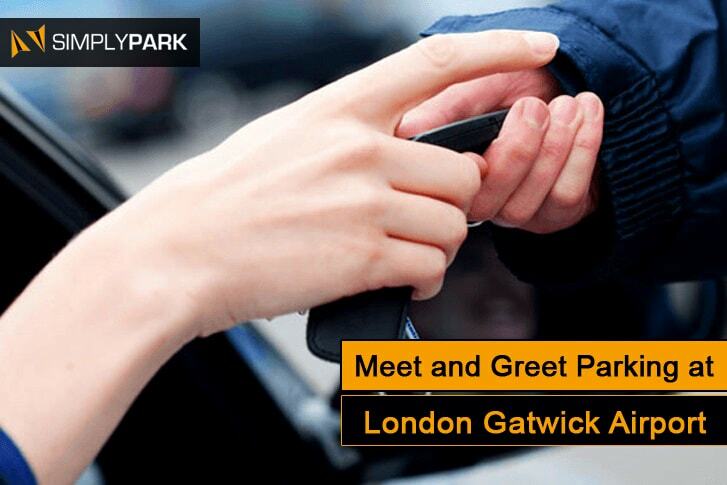 At Gatwick, meet and greet parking service is the quickest, easiest and cheapest parking around. Meet and Greet parking is another name of valet parking service. Travelling should be stress free and meet and greet parking is the first step to make your travel hassle free and simple. meet and greet parking allows you to park and fly without any trouble. We are offering cheapest meet and greet parking service at Gatwick ensures to make your air travel as easy and comfortable as possible. For people looking for convenience in parking at Gatwick, Meet and Greet parking is the perfect solution in cheap prices. We believe in providing the best meet and greet services let you book your parking and save your valuable time. Gatwick meet and greet parking assists you to give your holiday a hassle-free start. Now you can preplan everything and save yourself from the fear of missing a flight or getting late. In fact one of the issues of air travel is to find an appropriate and secure parking space for your car. Parking your car with meet and greet car park is now made easy. Meet and greet parking offers a wide range of parking at both, Gatwick parking at north terminal and Gatwick parking at south terminal to make it even more suitable, time saving and hassle-free for you. Now you can, without a problem, so even if it is your first time travelling this service will prove itself to be satisfying and worth spending your money on. We assure you won’t regret it. If you have a lot of luggage, or if you are travelling with children, so the Gatwick meet and greet parking is the best option for you. Gatwick car parking is also one of the most convenient yet cheap. With meet and greet parking you are in control of your schedule and rather than sticking to transfer timetables and carrying around that huge load of luggage with you, you can be dropped right outside the terminal and enjoy your flight in peace. Once you reach airport, an attendant from Gatwick meet and greet service will be present to receive you and take your car for valet parking and when you come back you’ll find your car waiting to meet and greet you. Meet and Greet parking services are made easy and simple for our valuable customers. Our customers are our first priority. Park and Ride, means you either park on-airport or off-airport and board a transfer bus to get to the selected terminal. Very convenient transfer buses function for both, the North and the South Gatwick terminals. Park and Ride at Gatwick provide you comfort and ease. You now don’t have to walk all the way through, carrying your luggage. With Simply Park and Fly you can ensure you not only save money but guarantee yourself a reserved parking space. Gatwick airport Park and Ride begins at just £8.00 per day, ensuring great savings over the gate price. Going out on a holiday is the best way to de-stress yourself. Air travel can be hectic and finding ease is one of the critical necessities. With ever-increasing traffic on the airports, finding a secure airport parking is extremely hard. Getting an immediate transition from parking a vehicle at the airport and heading for a flight is something that seems like an impossible idea, but Gatwick Airport long stay parking might be your best choice. Long Stay parking at Gatwick is a budget-friendly option for anyone traveling for more than a few days. It is convenient and secure so you don’t have to worry about your car. It provides free transfer to and from the terminal, so if you are looking for something cost-effective, then this is your best option. Gatwick Airport Short Stay parking service allows you to park and ride without any trouble. This Gatwick Airport Parking service ensures to make your air travel as easy and comfortable as possible. Short Stay Parking at Gatwick is the perfect solution. It is cheap and reliable. This service allows you book your airport parking and save your valuable time. Now you can preplan everything and save yourself from the fear of missing a flight or getting late. You can book your car park for few hours to several days, so if you are here to drop off a loved one, it would be very convenient for you and save a lot of your time. They aim to provide the quality service and is very secure, so you wouldn’t regret it. Gatwick north terminal parking will be a smooth experience for you as a lot of money has been spent to ensure that it lives up to the demand of the growing number of passengers every year. Having one of the largest air passenger bridge in the world, the travelers will get to enjoy sceneries of areas covering almost the entire airport. Gatwick parking at the north terminal thus provides you with an additional sightseeing experience free of cost! You will have plenty of other things to do at the terminal as well where the entertainment of the entire family is kept in mind so that none of the family members have a dull airport experience. Regarding parking, if you've chosen the park and ride service for the Gatwick north terminal, it is recommended that you arrive at the airport well in advance as it would take you some time to park the car and then go back to the terminal. Though the influx of passengers is regulated, the sudden increase in passengers during peak hours can lead to boarding problems as well. So, punctuality is something that you will most likely have to maintain for your parking experience to be as smooth as possible. For the Gatwick meet and greet at the north terminal, you don’t have to worry about parking the car yourself, so you have much more relaxation in this aspect. On your arrival back from your travels, the chauffeur will park the car as close to the terminal as possible, so it is easily accessible for you. You will find that the north terminal has been built keeping the needs of passenger in mind as your venture around and marvel at the beautiful architecture. Gatwick South Terminal has been built much like the north terminal, keeping in view the large number of people that use the terminal per year. It is for this reason that the terminal was designed to be modular. This means that later on, extensions to the design of the terminal can be made which gives greater flexibility to expand the services provided by the terminal. Gatwick South Terminal Parking is essentially the same as well though you find markers that distinguish the north from the south, so that you don’t get lost at the airport. After constant changes to the pier from the time when the airport was built, now the terminal has a walkaway and travellators that help the passengers on getting on board. You will find plenty of short stay options for Gatwick parking at South Terminal. Someone looking for to travel for a shorter period would prefer the parking closest to the terminal. Likewise, you also have the option of Gatwick meet and greet south terminal parking available. Simply book your service and let your chauffeur handle the car parking business while you relax. If you still want to park yourself, the park and ride service for the Gatwick South Terminal is a viable option as well. Regardless of whatever service you choose, you will notice there are plenty of things to do while your boarding time arrives. You grab something to eat from the various restaurants, take a drink from the bar inside the terminal or even complete the shopping list by going to one of the many shops present. Although it is the latest of the two terminals, you will realize that there is practically no difference in the services being offered as you enjoy your experience at the south terminal with a huge smile on your face. It is also one of the most convenient ways to park at Gatwick. With ABC Gatwick service all you have to do is to drive to the designated passenger drop-off area outside right the terminal and wait for our representative. You don’t have to worry about your car as it will be securely parked. With ACE Meet and Greet Parking service at Gatwick airport you simply drive to the airport terminal and you will be met by a professional Ace driver to hand your car over to. With SURE Meet and Greet Parking service at Gatwick airport No shuttle bus is required!! Because we will meet you at the terminal. Sure Parking aims to provide a convenient service by collecting the vehicle at the terminal as you depart and returning it upon arrival. This is one of the cheapest and the most popular service at the Gatwick meet and greet parking services. The vehicle is parked safely and securely in our secure car park, which is 5-6miles aways from the Airport, 24/7 and patrolled by mobile security. With this service of Gatwick Meet and Greet you simply drive to the airport terminal and you will be met by a professional driver to hand your car over to. On your return, your car is only a phone call away and will be delivered back to the terminal for your convenience. No shuttle bus is required!! Because we will meet you at the terminal. Simply Park Value aims to provide a convenient service by collecting the vehicle at the terminal as you depart and returning it upon arrival. Help-me-park is fully approved by Gatwick Airport to provide meet and greet parking services on the forecourt of both the North and South terminals, fastest drop off and collection times - no need to go into the multi- storey car parks, easy to find - right outside the terminal. When booking your Gatwick valet parking with JVP your parking contract will be carried out by the staff of Help-me-park the major operational parking company of Airport Parking Rentals (Gatwick) Ltd. All JVP valet parking drivers are mature, professional, courteous, fully insured and treat your car with the utmost respect, enabling us to boast a highly satisfied customer base.